Bio: William Rambaldi lives in Bologna, Italy, where for many years he has been practising the art of pastel. Recently William has recently been practising an innovative expressionistic technique with soft pastel. 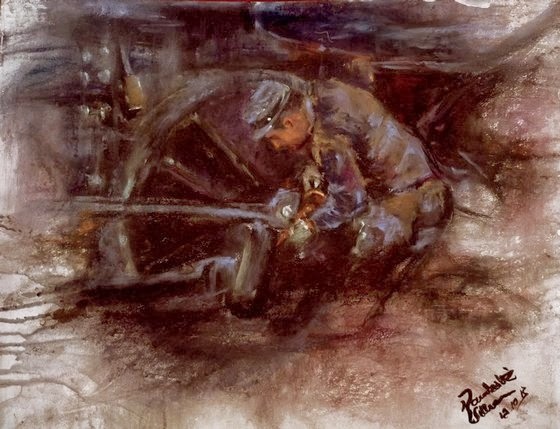 The painting is carried out in two phases: first a technical study; then a second phase based on the artist's intuition, in an instinctive and impulsive application of soft pastel. 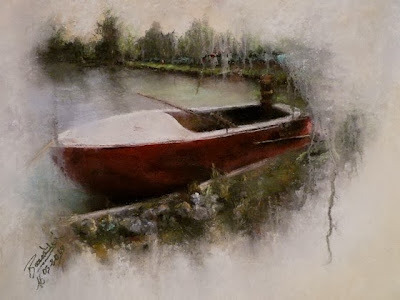 From the amount of work that William has been posting on the Passionate about Pastel Facebook page, this seems to be a productive means of painting in pastel without losing anything of the quality of the artwork or the medium. Style: His interpretive paintings focus on the reality of the subject and exaggerate the emotional side of reality rather than that perceived objectivity. Navigation: This website is in Italian, but it easy to navigate. Links remain available at the side of the page. Gallery: Paesaggi (Landscapes); Ritratti (Portraits); Figurativo (Figurative). Image View: Thumbnails enlarge in a viewer on the same page, and may be scrolled. (Don’t be put off by the manner in which the thumbnails assume a “frosted glass” appearance on mouseover – just click for an enlarged view.) Information is provided on title and dimension. There is a further zoom feature which is very useful as one can zoom in with the + and – buttons or the scroll wheel on the mouse, and this gives an excellent window on the artist’s technique and surface. Don’t miss the Apri L’originale button that looks like a square with an arrow at the top left corner – this brings a hi-res copy of the painting onto a new webpage and is very exciting. Il Macchinista is 40 x 50 cm, as is Il Barcone.